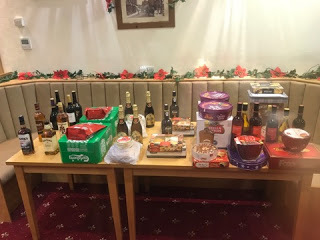 The Xmas Fayre is always well attended with several anglers fishing who only ever fish one or two matches a year. 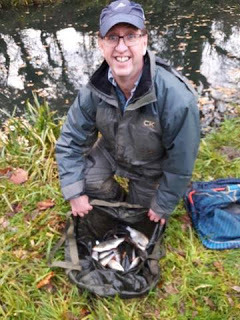 The twenty anglers would be split over the two venues, Dillington Pond and Ilminster Canal and I really fancied having a crack at the latter as I love the canal and haven’t fished it for ages. 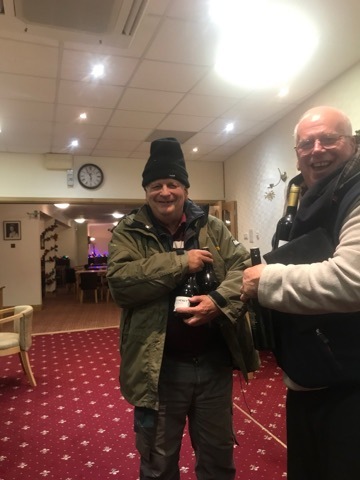 I got to the Bowling Club and it was great to see Andy Welch, Fred and Justin, even Ash had turned up (he must have heard it was on the pond! ), there was also another new face in the shape of Baz’s brother, Dasher, who was fishing his first match in 35 years! After breakfast and before the draw, Hurf announced that we would have a two minutes silence in memory of Bob which was a lovely touch. 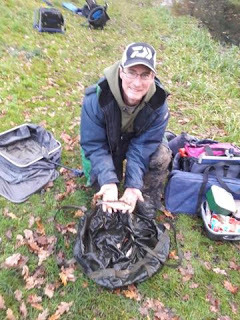 The draw got underway and as per usual I went in late and pulled out a ball which I hoped would be down the canal, it wasn’t but as it was peg 18 at Dillington, I wasn’t too upset as it’s normally a decent winter peg. Baz managed to pull out peg 24 for the second match on the trot and his drawing arm is on fire at the moment. Hurf was on peg 5 down the canal and we agreed to still have our usual side bet as did Steve P who was also down there on peg 3. I had rather a lot of bait this week, along with the usual maggots, casters and Bait-Tech Super Seed hemp, I had chopped worm for the canal and Pro Nat Dark for the pond, I’d also asked Steve to pick me up some pinkies in case it was hard. 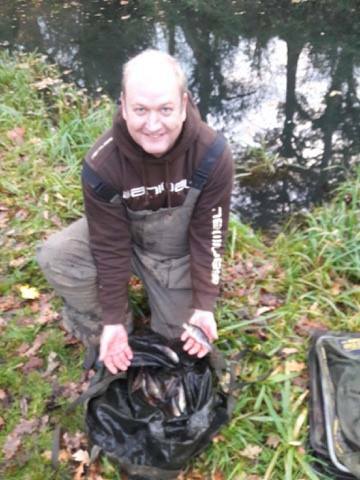 After a couple of frosts in the week, it was surprisingly mild today and I expected both venues to fish well. 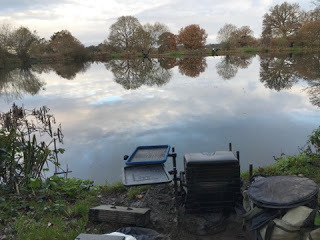 After the short drive I parked up and as I took my kit to the peg, I could see the pond was gin clear and it was flat calm too, what was more worrying was the fact that after being there a little while, I hadn’t seen a single fish top and I started to think I might need those pinkies after all. I mixed up some groundbait before setting up my rigs, a 0.5 gram Drennan Roach for fishing over groundbait at 10 metres, a 4 x 16 Preston Chianti for 11.5 metres if I had to go out further and a 0.4 gram Drennan Pencil to fish off the end of the reeds to my left. 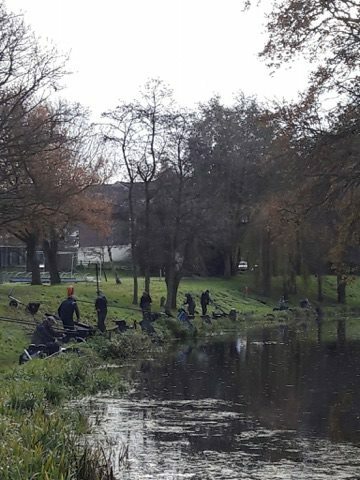 Just before the start, a couple of small fish topped out in the middle, which hopefully meant we’d get a few today. On the whistle, I cupped in a single ball of groundbait containing just a few pinkies and casters at 10 metres and then a big cup of chopped worm, casters, hemp and corn just off the reeds. 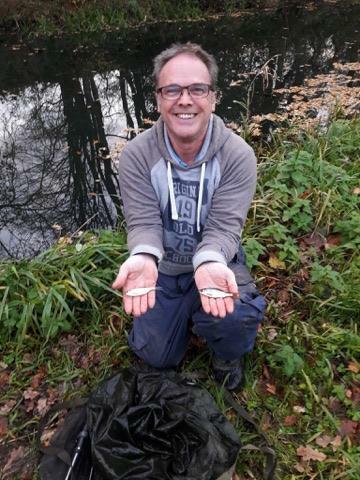 I put on a single disco pinkie and shipped out to 10 metres and I thought it might take a while to get a bite but the float settled and sailed away, for once I didn’t miss it and swung in a small roach. 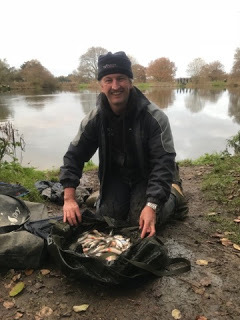 It was a bite a chuck from small roach and the odd perch, Adie on my left had started on the whip and was getting a few and I could see Ash on 17 shipping in and out. I tried caster and red maggot but it didn’t really improve the stamp although normally the bigger roach show later on so I’d keep on trying caster throughout the day. 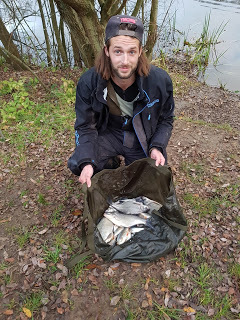 After an hour, I had 32 fish, mainly small roach although I did slip the net under a couple of slightly better 2-3oz fish and I probably had 2lb which was bang on my 10lb target if I could keep that catch rate up. 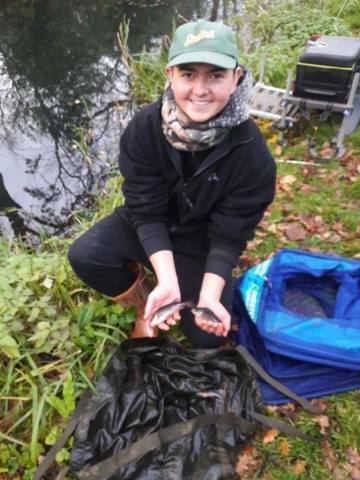 I fed a small ball of groundbait on my 10 metre line before picking up the heavier rig, slipping a grain of corn on trying my bonus fish line for the first time. 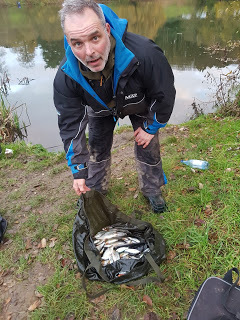 I gave it ten minutes but with no indications I was soon back out over the groundbait. I had a quick fish on caster but then couldn’t buy a bite, I switched back to single pinkie and started catching tiny little perch which was a worrying sign. Adie said he was struggling now as well, I could see Baz catching small fish and it looked like John D over on peg 10, Rob on 8 and Ash were getting a few but as far as I could tell nobody was bagging. The second hour was slower but I probably added another pound or so (including a Dillington barbel!) but already my 10lb target was slipping away. 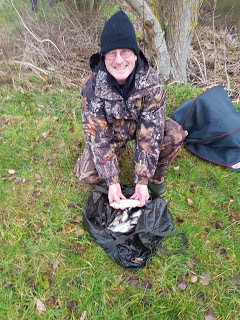 Another try for a bonus was fruitless so I cupped in another pot of choppie, caster and corn before going back out with caster and had a couple of better fish including a 4oz perch, I did have a better roach come off as I shipped back. 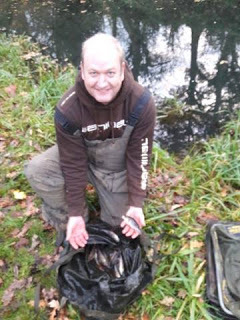 At the start of the third hour I tried double caster by the reeds, after a few minutes, the float disappeared but I missed it, back out and another good bite resulted in a small roach flying out the water and that was enough of that for now. 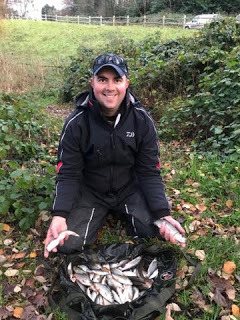 It was back to being a bite a chuck over the groundbait but the lack of quality was a bit worrying, going into the last hour, Adie said he’d seen Jake net a couple of skimmers but other than that I don’t think anybody had caught any big fish. 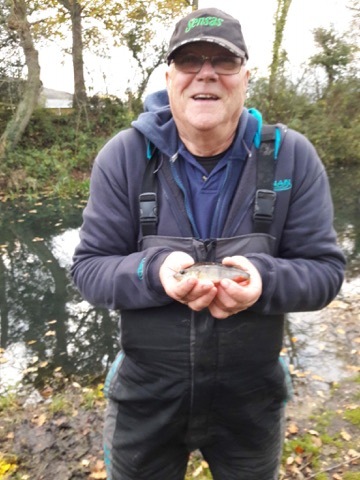 Adie had a slightly better perch and a chublet late on, I got to 103 fish (which at an ounce apiece would give me around 6lb) with five minutes to go, so had one last go by the reeds with corn on the hook but I never had a touch on it all day. 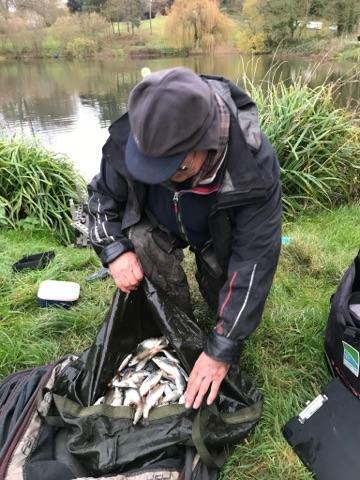 As I packed up Ash asked how I’d got on, I told him how many fish I had and asked how he’d done, he said he’d had more fish than me but was only admitting to 5lb (here we go again! 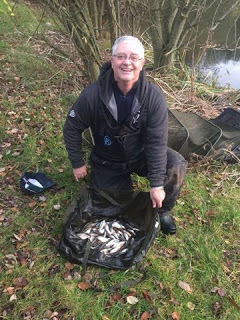 ), as I had the scales I went up to weigh Baz in first, he’d done really well to weigh 7lb 7oz and I said I thought he wouldn’t be far off with that. 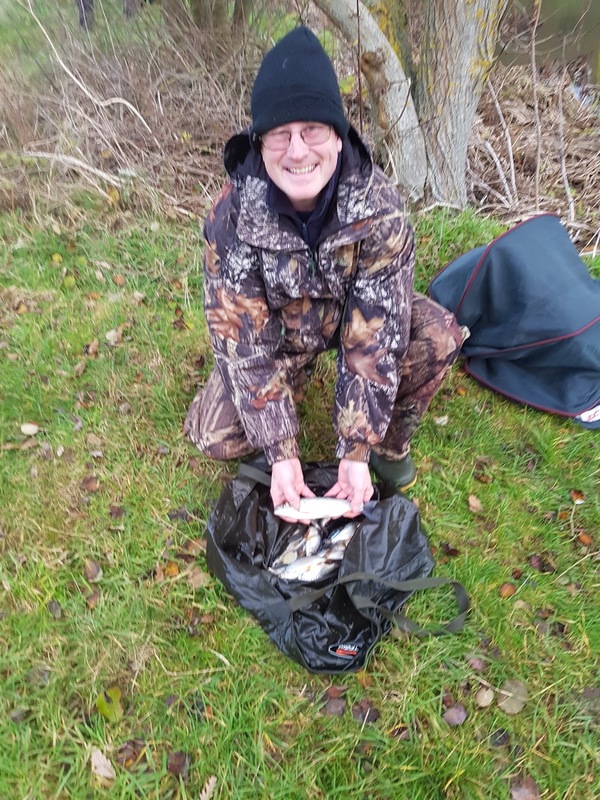 Dasher was next and had loads of fish for 2lb 9oz and said he’d loved every minute of it so hopefully we’ll see him again. 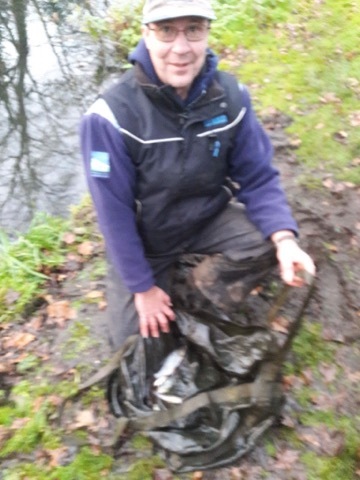 Adie had 6lb 8oz and I thought those two better fish late on had probably just pipped me. 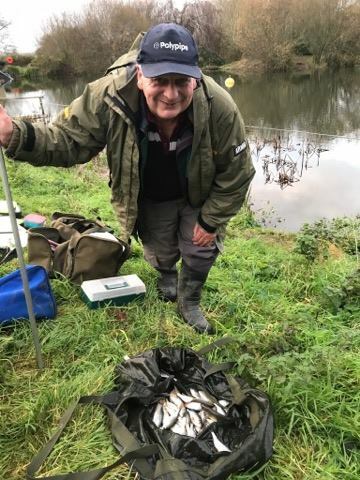 Dasher did really well to catch 2lb 9oz in his first match for 35 years! We got to my peg and when I pulled my net out, I knew it was going to be close and the needle settled on 7lb and I wished I hadn’t wasted an hour throughout the match trying to catch bonus fish. 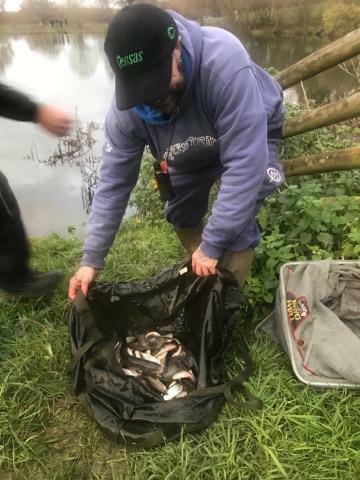 Ash was next and said he’d had another look at his fish and didn’t think he had 5lb, well they must have bred in the net because he plonked 9lb 10oz on the scales, now I know we all under estimate a bit (and I’m guiltier than most) but to be 100% out is just criminal! (I hope Santa doesn’t come down your chimney!). 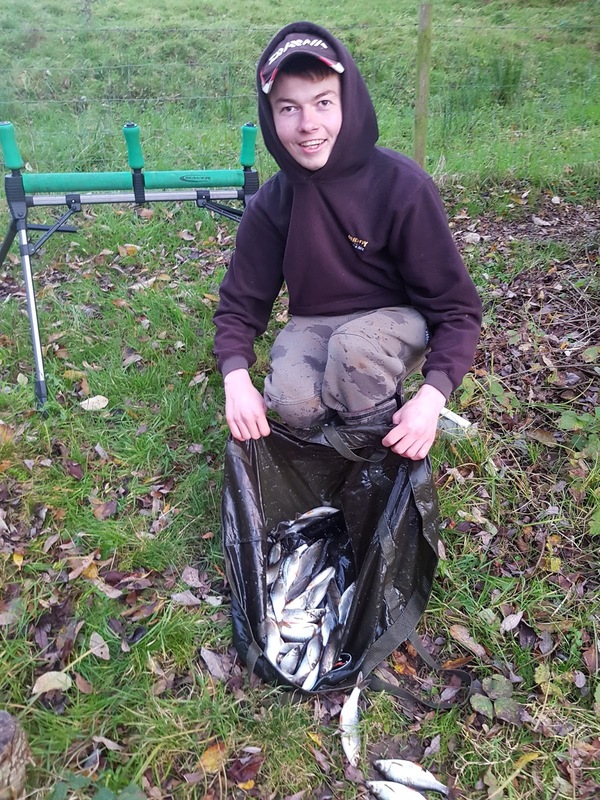 As the others arrived back, Jake had done brilliantly to weigh 15lb 8oz of skimmers and roach so he’d sneaked them in quietly and so had John D who had 8lb 3oz of small fish on peg 10. 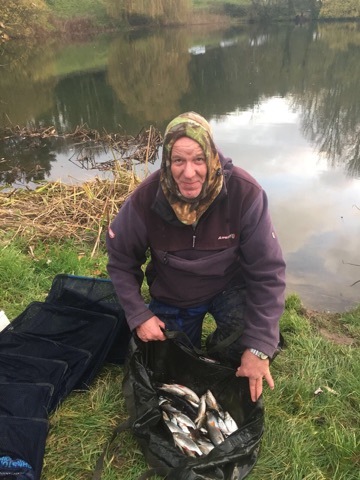 Rob had 5lb 14oz from peg 8 followed by Frank with 3lb 13oz from peg 4, Karl with 3lb 8oz from 13 and Tony with 2lb 1oz from peg 6. 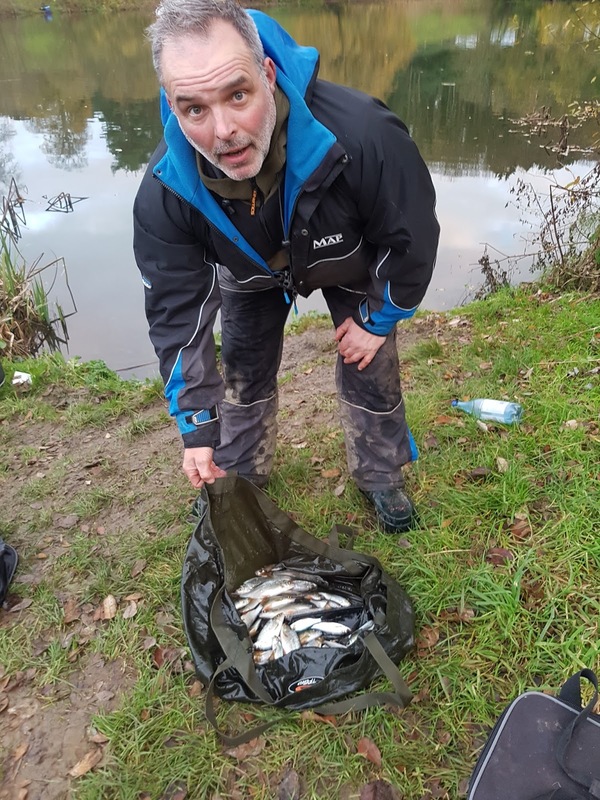 So that just left those down the canal although Adie had spoken to Bill earlier and apparently they were really struggling. Thanks to Rob Cox* and Jake Woodard** for the photos. Also not pictured was Fred who had 4oz and Steve P who didn’t weigh and had an early bath (you can let me have the pound next week mate, 5-2 now!). I have to admit I’m gutted the canal fished that hard because I love the place, I think maybe having nine down there was too many and five or six might have been better, I think we need to fish it when it’s milder to get a truer picture. Everybody enjoyed a nice hot meal before it was time for the prize giving, the top two on each venue picked up some super pools and then starting with Jake, people were called up to choose from a fantastic array of prizes (Terry said he’d make himself comfortable as he had a long wait!). I was called out in fifth place and picked a bottle of port, cheese selection and some crackers. 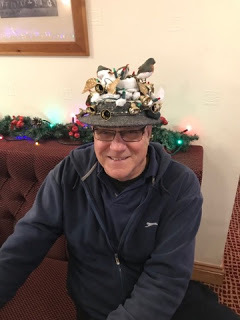 I have to say everybody fished the match in the spirit it was intended and that’s what club fishing is all about, Bill even wore his special Xmas hat with Dasher a close second as Papa Smurf! 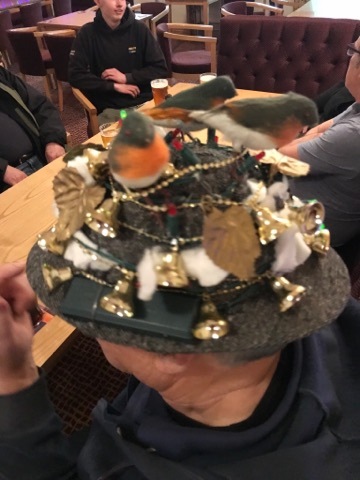 Bill’s Xmas hat is a work of art! The club and everybody who fished today would like to say a massive thank you to Hurf for getting all the prizes and organising the match along with Rob Cox and also to Ilminster Bowling Club for looking after us so well.